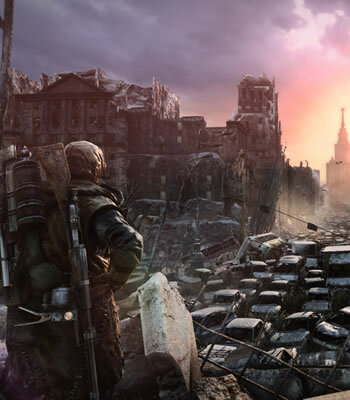 If you plan to play Metro: Last Light with eye-candy liberally applied, you'll probably want to check your expectations at the door unless you have a fairly solid rig. Publisher Deep Silver has announced the various degrees of system specifications you'll need to play at minimum, recommended and optimum settings. If you're just hoping to play with whatever configuration will let you make it through the experience, the title can be run with as low as Windows XP 32-bit, a 2.2GHz Intel Core 2 Duo, 2GB of RAM, and a DirectX 9-compliant graphics card in the realm of an Nvidia GTS 250 or an equivalent from AMD's Radeon HD 4000 series. The developer's recommended hardware skips forward to the present day, suggesting that you play on a machine with Windows Vista or later, a 2.6GHz quad-core processor such as a Core i5, 4GB of RAM and a DirectX 11-ready card that's in line with the GTX 580/660 Ti or an AMD counterpart such as the HD 7870. Meanwhile, if you have any intentions on learning what 4A Games considers an "optimum" experience, the studio says you'll need at least a 3.4GHz Core i7 or similar multi-core processor, 8GB of RAM and a GPU in the territory of a GTX 690 or GTX Titan -- a claim we're eager to test when we inevitably bench the game. As a side note, it's worth mentioning that the rumor about Nvidia bundling Metro: Last Light with its graphics cards turned out to be true. You'll get the sequel free of charge if you purchase a GeForce GTX 660 or better sometime between now and June 15 when the promotion expires (the game launches on May 14).